tips - Carleton Contracting Inc.
After hearing many horror stories right here in Prince Albert of negative contractor experiences we thought it was necessary to include this information so that you can be informed in your decision making for the right contractor to do the work on your home or business. First make sure that they have a City of Prince Albert Business License. Call 306-953-4384 to verify the business license or check their website (click here). Be sure that the contractor has Workers Compensation and business insurance. These are needed to protect you the homeowner. Also, visit local lumber yards and tell them about the work that you would like done and what contractors they would recommend. The yards will know how long a company has been in business, they reputation and if they pay their bills. **Before the work begins on your home or business please notify your insurance company. If anything were to happen to your home during the renovation or in the years after your insurance will only cover to replace the finishing and quality of your home when the policy was first signed. Have you done a similar job before? Will you use your own crew for the work or will you subcontract all or part of the job? In some cases, a contractor will give you a “fixed price” quote. A fixed price includes all the materials, labour, equipment and fees, plus contingencies, overhead and profit. In some cases allowances are established for items which you have yet to select, e.g., flooring and light fixtures. The allowance, which is only an estimate, is later adjusted once you have made your final selection. If it is difficult to estimate just how much the job will cost — for example, for an old house that might need extra work — you can use the “cost-plus method” for contracts. Remember, renovations may uncover hidden problems, so make sure you include a contingency budget to cover unforeseen costs. Look for a fair price- Factor in any differences in what the contractors are offering and the skills they bring to the job. Then add the intangibles: reputation, willingness to make suggestions and offer advice, the likelihood of standing behind the work. 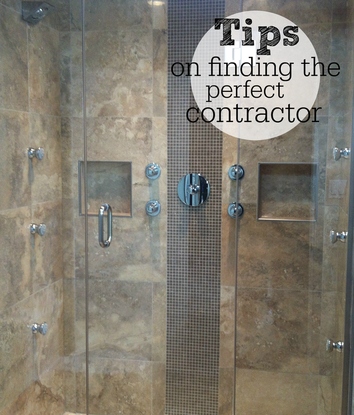 Choose the contractor you feel will give you the best overall value for your money. A cash deal may leave you with no legal recourse, if something goes wrong or the work isn’t satisfactory, or if the contractor walks off the job without finishing it. In fact, it makes it difficult for you to prove the contractor was ever there. And after you have paid the contractor, you may find that materials haven’t been paid for or workers haven’t been paid — and you are responsible for the bills. For your own protection and peace of mind, it’s best to deal in a legal and responsible way — always get it in writing. A detailed written contract between you and the contractor you hire is essential to any renovation or home repair project, no matter its size. Even the smallest job should be put in writing. Builders Lien Holdback -- This type of holdback is intended to provide homeowners with protection should subcontractors or suppliers place liens against the property to secure payment for work performed, and who may not have been paid by the general contractor, for their services. This allows a period of time, after the project is substantially completed, for them to make any required claim. At times, the general contractor will arrange for these funds to be held in trust by a lawyer. Where there are no subcontractors or suppliers involved with the project, this requirement will not apply. Note: The Builders Lien Holdback funds cannot be used to correct deficiencies. Each province has its own regulations regarding this type of holdback.Verify with your provincial authority for such rules or regulations in your area. Deficiency Holdback -- When a project is substantially complete, there will often be a number of items that are incomplete and/or which may need to be corrected. It is a standard procedure to hold back a reasonable amount of money (e.g., cost per item or a percentage of the total cost of the project) to cover the cost for these items. Once these items have been satisfactorily completed, complete payment is forwarded to your contractor. Seasonal or Delivery Holdback -- Depending on the time of the year (season) that your project is carried out, there may be items that cannot be completed (i.e., exterior painting, landscaping, etc.) and/or there may be products/material that are not readily available. In these situations, it is standard procedure to hold back payment(s) equalling the cost of the items remaining to be completed. There are several laws protecting consumers. Provincial and territorial consumer affairs or consumer relations departments usually administer consumer protection laws. They can help you resolve problems between you and your contractor. Sometimes a phone call is enough, but a letter outlining the problem (giving names, dates, addresses and details) is often required before any action can be taken. Write a description of the work you want done, with as much detail as possible. Check with your municipal building department to ensure that the work can be done and if zoning approval or any special permits are required. Ask friends and neighbours for recommendations. Get names from your family members, friends, local homebuilder and renovator associations, building supply outlets and, in some municipalities, your local building department. Ask contractors for their business licence number and check with the local licensing office and the firm’s insurance company for public liability and property damage insurance and workers’ compensation. Ask for references from past customers. Check with the Better Business Bureau for complaints against the contractor. A complete description of the work to be done by the selected contractor? Samples and literature showing different products that could be used? Depending on the size of the project, plans or sketches and specifications of the work to be completed? Correct and complete address of the property where the work will be done. Contractor’s name, address, telephone and GST numbers. Detailed description of the work, plans (or sketches) and a detailed specification of the materials (type, quality, model) to be used. The right to retain a lien holdback as specified in provincial law. A clause stating that work will conform to the requirements of all applicable codes, such as building, safety and fire codes. The price and payment schedule (keep in mind the lien and seasonal holdbacks). Agreement on who (homeowner or contractor) is responsible for all necessary permits, licenses, inspections and certificates. Workers’ compensation for all employees of the contractor or subcontractors. All work carried out under the contractor, including work done by subcontractors. Warranties on all contractor supplied work and materials (in addition to manufacturer’s warranties) for a period of at least one year. Ensuring that all contracted work conforms to zoning bylaws. Ensuring adequate working space and freedom of movement for workers, and use of utilities. Ensuring prompt payment according to the requirements of the law and the holdback and payment schedule.